Back to Buttermilk Country Bread! | Delicious! Delicious! Glad to have you back – Happy New Year! Very nice looking loaf of bread! I can smell it from across my screen! Now I can maybe make this bread. I suffer from yeast-a-phobia and just the mere mention of the stuff sends me to the corner in a fetal thumb sucking position. Welcome Back! Lovely bread. Nice to have you back. Yay! Another fun installment in the life of Chef Caryn. I hope you’ll be putting out a book in the future with your recipes and story installments. You’re fabulous! The bread looks yummy! Thanks for coming back. Yeah, your back! Bread looks fabulous BTW! Looks wonderful and I love the idea of holding the unbaked load overnight in the fridge! 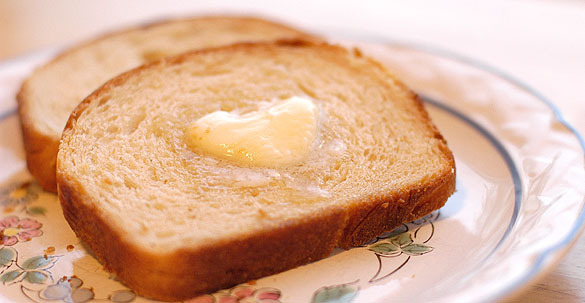 Is the heart shaped pat of butter on this bread a kind of graphic foreshadowing?? Regina, this is a fairly easy recipe as far as yeast breads go. It’s a smaller loaf and a little easier to work with as a result. You also don’t need to proof the yeast in water…just mix and knead. Good luck! FJK, I was wondering if anyone would notice that butter melting in a heart shape! Pure coincidence, I assure you. So glad you are back and that bread looks absolutley wonderful! Great picture. Nice to have you back! Caryn, the bread is wonderful. I made it yesterday, baked it today, and haven’t been interested in anything else! I must confess I love buttermilk almost anything and your bread receipe will be a nice addition to try. However, why the honey? Why not no sugar or sweeteners? I make all my regular breads without sugar or sweetners and they work fine. Anybody else? Country breakfasts are a huge treat to me. I’m looking forward to trying the bread. This recipe is doable in the toaster oven, if you have the right one. It will run a little less time. Its too bad you are not posting anymore Caryln, but thanks for keeping the site up! I have a blog on the best toaster ovens if you want to check it out!